WATCH: 'Apocalypse Now' Original Movie Trailer 1978, with laurence fishburne. FISHBURNE'S YOUNG SOLDIER: Despite being made 35 years ago, director Francis Ford Coppola's movie 'Apocalypse Now' still resonates today for an army of film buffs, young and old. Actor Laurence Fishburne was cast in the role of Clean at the age of 14, although he told Coppola he was 16. The number of people worldwide who Google the phrase, “Laurence Fishburne Apocalypse Now” each month. The number of people worldwide who Google Laurence Fishburne's name each month. The number of people worldwide who Google the title “Apocalypse Now” each month. *All figures for “Actor Laurence Fishburne And Apocalypse Now, According to Google Search”, supplied by Google. Stats include global totals for laptop and desktop computers and mobile devices. 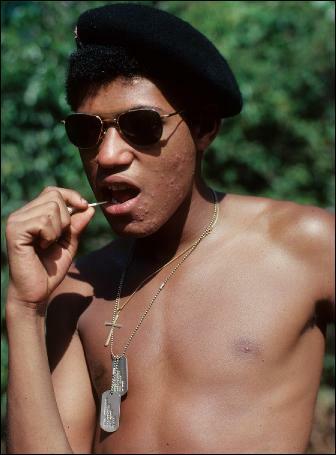 ACTOR LAURENCE FISHBURNE was a 14-year-old virgin when he landed the role of young crewman, Clean, in the mythic, surreal Vietnam war epic, Apocalypse Now (1979). Fishburne (known as “Fish” to his friends) was born in Augusta, Georgia, on July 30, 1961. His father, Laurence Fishburne II, was a juvenile corrections officer, while his mother Hattie was a schoolteacher. He was raised in the Park Slope area of Brooklyn, New York City. He was just 10-years-old when he earned his first acting pay cheque in the off-Broadway play In My Many Names And Days. He then spent three years on the TV daytime soap, One Life To Live, after which he made his feature debut in the urban drama, Cornbread, Earl And Me (1975). There was one audition in particular which would change his life forever. At the age of 14 Fishburne, in an often repeated tale, lied about his age in order to cast for a role in the upcoming Apocalypse Now with director Francis Ford Coppola. Although he told Coppola and his production team that he was 16, they knew he wasn’t. “I think they knew,” Fishburne recalled recently on TV show George Tonight. “I don’t think I was fooling anybody.” In fact, Coppola actually intended for Fishburne to pass for 18, not 16, when he was hired. Fishburne won the role of Clean, one of the young crewmen that travelled up river with Martin Sheen and the PT boat crew in search of the infamous Colonel Kurtz, played by Marlon Brando. But after 18 months filming in the jungles of the Philippines, the environment, and the length of time on location, began to take its toll on Fishburne and his mother Hattie, who had come out with him, as chaperone and tutor. She became worried about his increasingly rebellious attitude, and so she called his father to join them in the Philippines. Fishburne senior’s son had ventured into the jungle a talented unknown, and emerged both a man, and a movie star. Ben Arogundade's book Black Beauty is out now. ACTOR LAURENCE FISHBURNE LIED about his age when he auditioned for a part in the movie Apocalypse Now. Then, when filming started, his father arrived to discipline his rebellious son. By Ben Arogundade.